Seventeen-year-old Ciardis Vane grew up in a small village on the edge of the realm. Beautiful, destitute, and desperate she is looking to get out anyway she can. She has worked her whole live as a laundress with no hope of escaping her fate anytime soon. But then her life changes when a strange woman appears with the key to Ciardis’s escape. With an offer to take her to the capital and a life she’d never dreamed of, it’s hard to resist. There’s only one catch. She wants Ciardis to become a companion: she’ll be required to wear expensive dresses, learn to conduct suitable magic, educate herself on court proclivities, and – in the end – chain herself to the highest bidder. A Patron for life. But what she does not know is that she will soon be at the heart of intrigues and power struggles, and that her new life in luxury demands a high price, perhaps even the life of a prince. "A USA Today Recommended Read	★ Kobo Most-Read Book Of 2015 ★ RT Book Reviews 4 Stars"
"If you're a fantasy lover, this is one world you don't want to miss out on!" 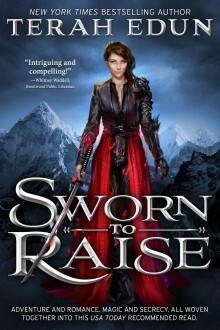 "Teens will find Sworn to Raise a compelling saga of magic, romance, and one young woman's struggle to find and understand her role in her world." "Recommended read…plot was intriguing and the world building was compelling!"